The actor Hanagiri Toyomatsu III held the name of Hanagiri Tomimatsu I from the 11th lunar month of 1781 to the 10th lunar month of 1789. Dates of birth and death unknown. Elder son of Hanagiri Toyomatsu III, his first stage name was Hanagiri Motokichi. 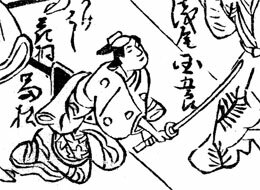 His father Hanagiri Tomimatsu I took back the name of Hanagiri Toyomatsu III in the 1st lunar month of 1789 in Kyôto at the Nishi no Shibai and gave his son the name of Hanagiri Tomimatsu II. They performed together in the new year drama "Keisei Kogane no Shachihoko". He became zamoto in Ôsaka and produced at the Naka no Shibai in the 11th lunar month of 1791 the kaomise drama "Furisode Shuten Dôji", which welcomed in Ôsaka the Edo star Sawamura Sôjûrô III. He played in the 5th lunar month of 1793 the role of Princess Tamaori in the drama "Ichi-no-Tani Futaba Gunki", which was staged at the Kado no Shibai (the role of Atsumori was played by Asao Okujirô I). This wakaonnagata actor was active in Ôsaka up to the end of 1796 or the beginning of 1797. After the death of his father, he received the support of Yoshizawa Iroha I. 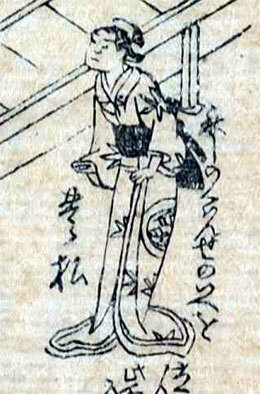 His rank in the 1st lunar month of 1797 Ôsaka hyôbanki, wakaonnagata section, was jô-(shiro)jô (superior - (white) superior). Then, he disappeared from the records.